In addition to our residential building services, we can work with you on commercial building projects to make sure your new Davidson, NC office fits with the personality and goals of your company. Commercial Building in Davidson – Commercial building can be an overwhelming process, especially if you are looking to a new construction project. There are many aspects of a new commercial building to consider, including large-scale items, such as the floor plan, electrical, and plumbing, as well as smaller details, such as millwork and hardware. At Chad Goodin Signature Homes , we understand that these decisions can be tough to make, so we will work with you to make sure each aspect of your new office fits with the personality and goals of your business in Davidson, North Carolina. Even before we start a commercial building project, our team will work closely with you to find the right lot. We have great business relationships with local architects, who can design the perfect building for your company, and we will be a liaison to make sure your needs are met. We also work closely with local lenders, helping you to get the financing you need to make your dream office become a reality. Our finished projects are high-quality and add value to their communities. The main focus for our team is customer service, so we will never leave you in the dark with unanswered questions or confusion about the next steps in the commercial building process. We also provide renovations of all sizes for commercial buildings, whether you want to simply update the look of your lobby, or completely start over with the look of your office. 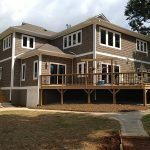 At Chad Goodin Signature Homes, we provide high-quality commercial building services in Davidson, Mooresville, Cornelius, Huntersville and the surrounding Lake Norman area of North Carolina.